Over the past decade, research has emphasized the need for today’s young professionals to possess deep disciplinary knowledge along with a keen ability to communicate across social, cultural and economic boundaries. What is a T-shaped professional? Currently higher education is producing I-shaped graduates, or students with deep disciplinary knowledge. 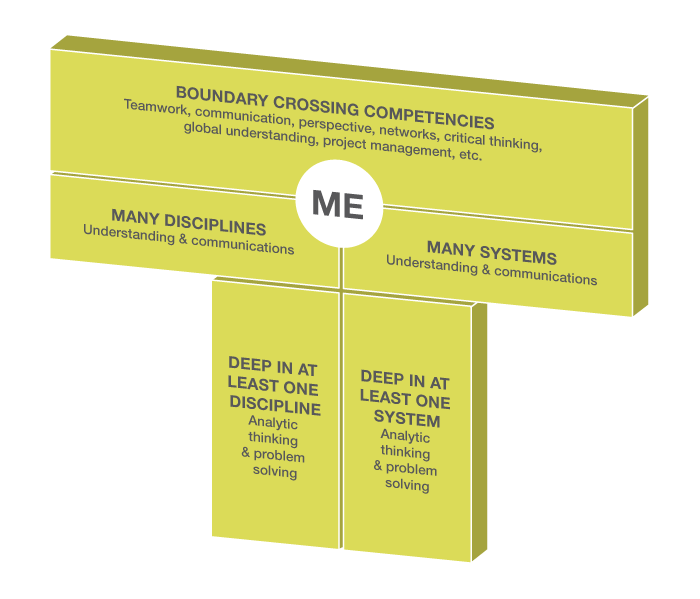 T-shaped professionals are characterized by their deep disciplinary knowledge in at least one area, an understanding of systems, and their ability to function as “adaptive innovators” and cross the boundaries between disciplines. The two vertical bars of the "T" represent the disciplinary specialization and the deep understanding of one system. Systems describe major services, such as transportation, energy, education, food, and healthcare, that impact quality of life. These systems are comprised of interconnected components of people, technology, and services. To understand a system, one must know how it functions from the bottom to top in order to address challenges. The defining characteristic of the “T-shaped professional” is the horizontal stroke, which represents their ability to collaborate across a variety of different disciplines. To contribute to a creative and innovative process, one has to fully engage in a wide range of activities within a community that acknowledges their expertise in a particular craft or discipline and share information competently with those who are not experts. Why is it important to be a T-shaped person? In comparison with the “T” shaped individual, the “I” shaped individual is focused largely on their particular knowledge and skill-set, views the workplace as a competitive environment, and works within disciplinary silos. Currently many college and university graduates have been trained to be productive in one field, but employers are placing increasing importance on skills that reach beyond a single discipline or focus. Upon graduation, students should be able to handle information from multiple sources, advance professional relationships across different organizations, contribute innovatively to organizational practices, and communicate with understanding across social, cultural, economic and scientific disciplines. Tomorrow’s workers will build their careers in a globally interconnected and constantly changing world with smarter technologies in an effort to effect positive global change. Why is this a critical time for a T-shaped professional meeting? Over the past decade, research has emphasized the need for today’s young professionals to possess deep disciplinary knowledge along with a keen ability to communicate across social, cultural and economic boundaries. These “T-shaped professionals” are in high demand for their ability to innovate, build relationships, advance research and strengthen their organizations. Who should attend the T-Academy? This T-Academy provides campus leaders and other stakeholders with the tools necessary to design educational models that foster and develop T-shaped characteristics that are in high demand today and in the future workforce. The emphasis of this session is on creative development of campus projects, using the power of group interaction to hone those design.